Lush hair, glowing skin and healthy strong nails! We all strive to maintain these and plan our dietary needs accordingly. However, due to current lifestyles it is difficult to maintain that lush hair or growing skin. And nails often are brittle and broken. YouthBerry’s supplements for Hair, Skin amp; Nails are packed with natural ingredients and nutrients that ensure you look healthy not only inside but also outside! 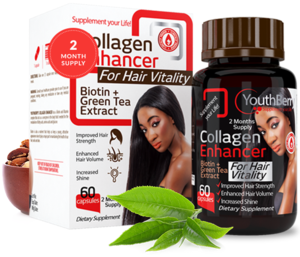 YouthBerry’s Collagen Enhancer has a Biotin and Vitamin complex that acts as a coenzyme in the body that’s needed for the metabolism of fatty acids, amino acids and glucose. Biotin is also a nutrient that helps us keep a young, attractive appearance since it plays a major part in maintaining the health of our hair, nails and skin. The Collagen Enhancer improves the vitality of your hair making it stronger, shiny with extra volume. 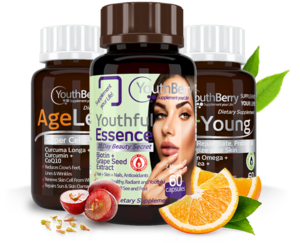 YouthBerry’s Ageless formula has a unique blend of Curcuma Longa, Curcumin, Grape Seed Extract and CoQ10. This complex naturally helps neutralize harmful free radicals, which amplifies skin ageing. AgeLess rejuvenates, moisturizes and hydrates your skin from within and naturally strengthens collagen in your skin making you look younger and fresher. 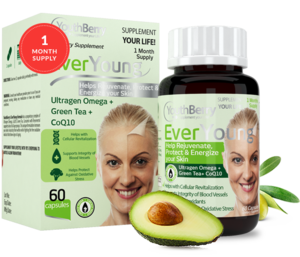 YouthBerry’s EverYoung formula has a proprietary complex of Ultragen Omega, CoQ10, Green Tea, and Curcumin with Reservetrol that supports skins of all age groups. This unique formulation increases your skin’s elasticity from within while fighting the free oxidative radicals that show signs of ageing. Now supplement your lifestyle with YouthBerry’s EverYoung to notice a glow from within! 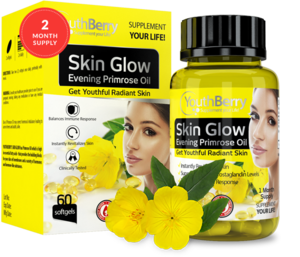 YouthBerry’s Skin Glow has Primrose Oil, which is high in essential fatty acids that provide the building blocks for your skin cell membranes and a variety of hormones and hormone-like substances. A hormonal imbalance can lead to acne in teens and adults alike, and many people don’t realize that acne can be treated naturally with Primrose Oil. Now revitalize your skin naturally with a youthful radiant skin with Skin Glow supplements! 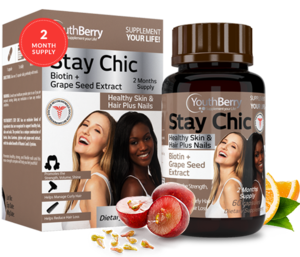 YouthBerry’s Stay Chic is an exclusive blend of ingredients that are recognized to support healthy hair, skin and nails. The supplements are a unique combination of biotin, Beta Carotene, glycine and grape-seed extract, with the added benefit of vitamin C and L-Cysteine. Stay Chic promotes healthy, strong, and flexible nails while this max-strength complex will help you feel youthful! It’s not easy to maintain beautiful skin, hair, and nails in today’s world with our lifestyle. Everything from pollution to stress to UV rays adds to the challenge. 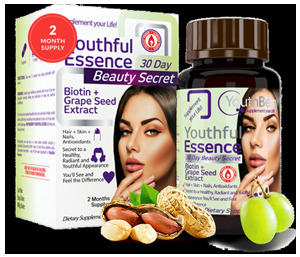 YouthBerry’s Youthful Essence will help you look your best with potent extracts like Grape Seed and Biotin. Now, see and feel the young radiance that is you!